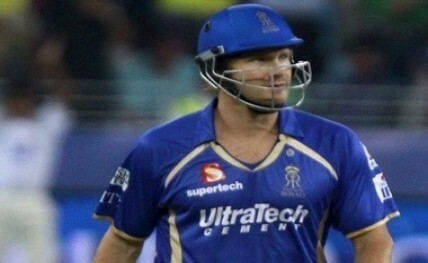 Ranchi, May 13 (IANS) Rajasthan Royals captain Shane Watson won the toss and elected to bat against Chennai Super Kings in an Indian Premier League (IPL) match at the JSCA International Stadium Complex here Tuesday. Chennai Super Kings: Dwayne Smith, Brendan McCullum, Suresh Raina, Faf du Plessis, Mahendra Singh Dhoni (captain/wicketkeeper), Ravindra Jadeja, Vijay Shankar, Ravichandran Ashwin, Ishwar Pandey, Mohit Sharma, Samuel Badree. Rajasthan Royals: Ajinkya Rahane, Karun Nair, Shane Watson (captain), Stuart Binny, Dinesh Yagnik (wicketkeeper), Steven Smith, James Faulkner, Kevon Cooper, Rajat Bhatia, Pravin Tambe, Ankit Sharma.